DS214 delivers outstanding read/write performance with an average over 106.38 MB/sec writing speed under RAID 1 configuration in a Windows environment, and over 110.65 MB/sec reading.1 The built-in floating-point unit enhances the overall capability of the main CPU, and is particularly advantageous in speeding up thumbnail creation when uploading large amounts of photos or videos. To ensure your data safety and convenience, the tool-less hard drive trays allow you to install 3.5" hard drives without a screwdriver. Additionally, DS214 supports hot-swappable hard drive trays, enabling instant and risk-free hard disk replacement. Enjoy seamless files sharing across Windows®, Mac®, and Linux® platforms as DS214 offers comprehensive network protocol support including FTP, SMB2, AFP, NFS and WebDAV. With Windows AD and LDAP integration, DS214 can fit effortlessly into any existing network environment - there is no need for IT administrators to maintain two sets of credentials. You also won't worry about missing files with the Recycle Bin feature which is supported on AFP, CIFS, File Station, and WebDAV. All files deleted in a shared folder will be automatically moved into the Recycle Bin. DS214 is highly compatible with other devices, letting you manage and enjoy digital content with the devices you already have: computers, mobile devices, TVs, DLNA devices, and stereos. Synology offers the latest support for TV streaming, including Samsung TV, Roku players, Apple TV, and Google Chromecast, meaning you can stream digital content stored on DS214 to your widescreen TV effortlessly. Synology develops versatile mobile apps — DS note, DS audio, DS video, DS photo+, DS cloud, DS file, DS download and DS cam — allowing you to access and manage the contents of your DS214 with smartphones and tablets. 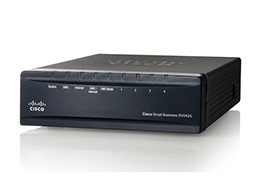 QuickConnect brings an easier network experience as it eliminates complicated router configuration or port forwarding. With Synology mobile apps, your multimedia collection and work files are always on the go. 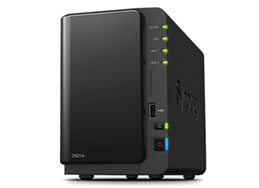 All Synology NAS is designed with energy efficiency in mind. DS214 only consumes 7.49W in HDD Hibernation and 14.67W in access*. With special fan and the smart airflow design, the DS214 keeps the system running cool 24/7, while its noise dampening design makes it quieter than PC counterparts. Synology acknowledges the responsibility as a global citizen, so all Synology products are produced with RoHS compliant parts and packed with recyclable packing materials. 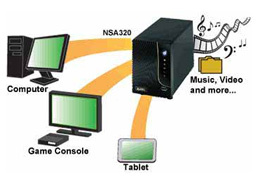 The NSA320 is more than a hard drive enclosure – it’s an entertainment hub for the modern age. Just plug in up to 2 3TB drives (sold separately), and you’ll be ready to store, share, and stream your digital media in crystal clear HD to any game consoles, PCs, phones,digital media players, PDAs, or any other DNLA-capable device using your home network. Automated backup makes protectingyour _les a hassle-free experience, and programmable PC-independent downloads guarantee you’llnever have to waste any time making sure the newest podcasts, videos, and software updates are right at your fingertips – no matter what device you’re using. 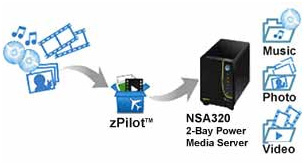 Step into the modern age with the NSA320, and set your media free. 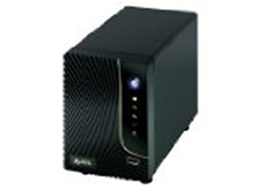 With a powerful CPU and a read/write rate up to 4x faster than most network storage appliances, the ZyXEL NSA320 2-Bay Power Media Server can quickly transfer, backup and stream large multimedia files throughout your home network. It’s the perfect media hub for any household, able to handle multiple simultaneous 1080p high-definition streams to different UPnP and DLNA-certified devices such as Microsoft XBOX360, Sony PS3 and DLNA-enabled TVs throughout the house. The NSA320 makes it easy to manage, back up, and play all of your media - freeing you to display it however you want, wherever you want. With only a few clicks, you can upload photos, organize them into presentations, and even set your presentations to music - or stream _les to devices throughout your house. Boasting the versatility to act as an iTunes Server, SqueezeCenter, or personal blog and photo album server, your media will be free to share and stream to PCs, laptops, MP3 Players, and SqueezeBoxes anywhere on your home network. The NSA320 allows users to automatically upload and download _les without ever turning on a PC. RSS feeds allow you to set up automatic downloads of Internet content such as Audio & Video podcasts ensuring that all your favorite media will be ready and waiting for you as soon as it hits the internet. ZyXEL’s browser plug-in for Internet Explorer and Firefox allow you to automatically send eMule, BitTorrent, FTP, or HTTP downloads directly to the NSA320. This allows you to turn off your computer after starting a large download, with the NSA320 completing the download for you independent of your PC. In addition, the NSA320 makes managing user-generated media a snap. With a few clicks, the NSA can be set to automatically upload photos, video, music, and other content to sites like Flickr, Youtube, or even your own FTP server. 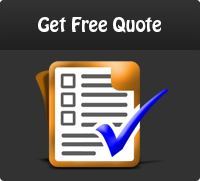 There's no input required, and no need to deal with multiple sites or services. Just put your media on the NSA, and it'll handle the rest. zPilot automatic file classification makes it easy to store and manage media files. Just drag files onto the zPilot icon on your computer's desktop and they'll automatically be identified, organized, and delivered to your the music, photo, video, or other designated folders on the NSA320 - Organizing your media collection has never been simpler. The NSA320 is more than a hard drive enclosure – it’s an entertainment hub for the modern age. Just plug in up to 2 3TB drives (sold separately), and you’ll be ready to store, share, and stream your digital media in crystal clear HD to any game consoles, PCs, phones, digital media players, PDAs, or any other DNLA-capable device using your home network. Automated backup makes protecting your files a hassle-free experience, and programmable PC-independent downloads guarantee you’ll never have to waste any time making sure the newest podcasts, videos, and software updates are right at your fingertips – no matter what device you’re using. Step into the modern age with the NSA320, and set your media free. The NSA320 is the ideal way to store even your most sensitive files without worrying about unauthorized access. A sophisticated IP filter table management algorithm protects your data from malicious attack. When backing up from the NSA320 to a device of ZyXEL's NSA family, the encrypted Remote Replication feature optimizes protection of your valuable information. The SATA interface in the NSA320 allows you to group both hard disks to create a RAID1 mirroring environment for enhanced data protection. As a final safeguard against accidentally deleted data, the NSA boasts a networked recycle bin, allowing accidentally deleted data to be quickly restored. 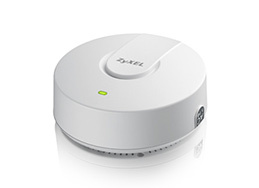 ZyXEL’s green Wake-On-LAN feature lets you access files stored on the NSA320 anytime and anywhere, even if the device is powered off at home. To further save energy, if there’s no hard drive activity for a set period of time, the drives will automatically go into hibernation mode. Finally, power scheduling provides a convenient way to manage your power consumption by allowing the user to set the device to turn off or on based on your unique usage patterns. 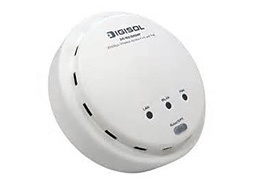 DIGISOL Wireless Access Point DG-WA3002NP enables communication between wireless and wired notebooks/desktop computers in the network. It complies with IEEE 802.11n standard and is backward compatible with IEEE 802.11b/g standard. The DG-WA3002NP wireless Access Point can provide wireless data transmission rate up to 300Mbps which enhances the sharing of files, photo, audio, video and gaming experience over wireless network. 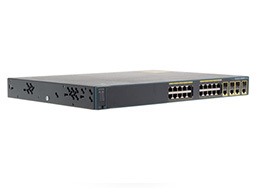 The WS-C2960G-24TC-L ships with (20), 10/100/1000 Ethernet ports, and (4) dual purpose uplink ports (each dual purpose uplink has one SFP port and one 10/100/1000 Ethernet port, one port active at a time).